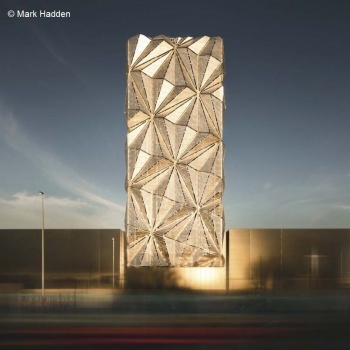 The cladding of the flue tower unites sophisticated engineering and complex optic research to create an impressive sculptural concept on a huge scale. The unique cladding is formed of hundreds of triangular panels, each the height of a London bus, that fold and flow across the surface of the tower. The resulting complex geometric patterns visually break up the elevations to create an uneven, sculpted surface that plays with the vanishing points and perspective. The panels are perforated to exploit the phenomena of the Moiré Effect, and at night an integrated lighting design produces a shifting series of ‘compositions‘ lit from within the structure. The tensile strength and ductility of steel made it the obvious choice to cope with the effects of high wind loading on the tall, slim structure. The industrial aesthetic of steel lent itself to the historical context of Greenwich Peninsula, whilst the cross bracing of the structure echoes the neighbouring gas holder dating from 1886. 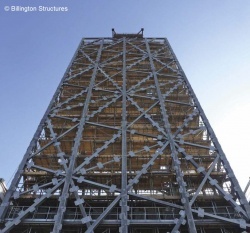 345 tonnes of galvanized steel were erected for the flue tower, which consisted of five main cantilever latticed girders, each formed from three 16m high by 3.15m wide sections spliced at third points on-site and placed 4.5m apart. These were connected with interleaving diagonal secondary members fixed to both chords on the main east and west façades. Close coordination with the cladding sub-contractor was fundamental to achieving the correct setting out and detailing for the hundreds of fixing brackets; each fabricated as part of the steel frame with sufficient tolerance to allow seamless connection and adjustment of the cladding panels throughout the build.